'Advice from the Bureau of Meteorology is the wild weather could continue through to Friday, she said in a statement late on Wednesday. Brisbane was in chaos on Wednesday evening, after some of the heaviest rain in years. Roads and watercourses were flooded, sparking many rescues. 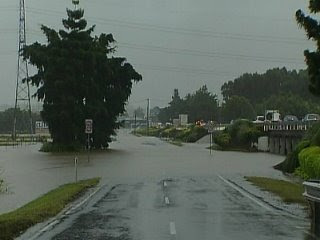 The city of Ipswich, west of Brisbane, was all but cut off with floodwaters closing the Ipswich Motorway and most alternative routes cut. The Bureau of Meteorology said that in the 24 hours to 7pm (AEST) Wednesday, Brisbane's CBD had received 159mm of rain, Redcliffe north of Brisbane 141.6mm, Beerburrum north of Brisbane 236.6mm, and the Gold Coast 83.6mm. But the figures for the 24 hours to 9am on Wednesday were even more alarming. Beerburrum had its wettest one-day period in 17 years with 302mm of rain. Over the same period Redcliffe received 151mm, and Brisbane city 89mm - its wettest 24 hours in eight years. The mean May rainfall for Brisbane's CBD is 73.7mm. The upside is that the combined levels of Brisbane's dams has jumped by 8.22 per cent to 67.5 per cent of capacity - the most water they've held since 2002. Rain in the past 24 hours alone has added about 8.5 months' supply to the system. Severe weather, flood and coastal wind warnings remain current throughout the southeast.